If one Baby Trump balloon caused a commotion in the U.K., what will four do in the U.S.? Americans may soon find out as activists announced this week that they have raised enough money through a GoFundMe campaign to create not one clone of the 20-foot-high Baby Trump balloon but four, and send them on a “border-to-border” tour of the United States. As of Wednesday, the campaign to bring the original balloon to America had raised $23,695 in five days from 1,059 people, more than five times the $4,500 goal. So much money poured in that the campaign is no longer accepting donations. The American tour is a joint effort of Didier Jiminez-Castro, a social worker and activist from Hillsborough, New Jersey, and Jim Girvan of Branchburg, N. J., part of a group called the People’s Motorcade, which stages weekly protests at the Trump National Golf Course in Bedminster, N. J. On Wednesday, Girvan announced the plan to “deliver” four Baby Trumps. ”We’ve gone from a single baby to expecting quadruplets,” he told NJ Advance Media. 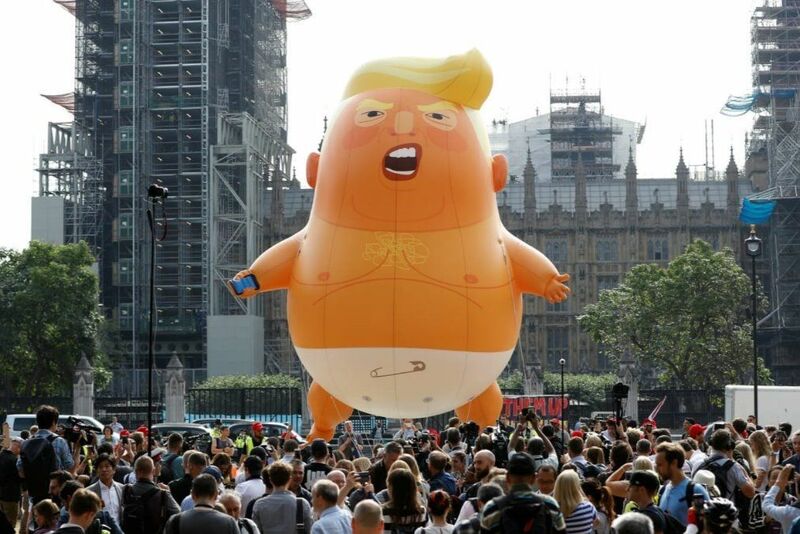 The organizers say on their fundraising site that they were inspired by the group in the United Kingdom that launched the first Baby Trump balloon to protest President Donald Trump and his policies during his visit last week to England and Scotland. The design has been credited to a British activist named Leo Murray, who came up with the idea for the balloon, and a graphic designer named Matt Bonner, who works for a firm called Revolt! and executed the concept. 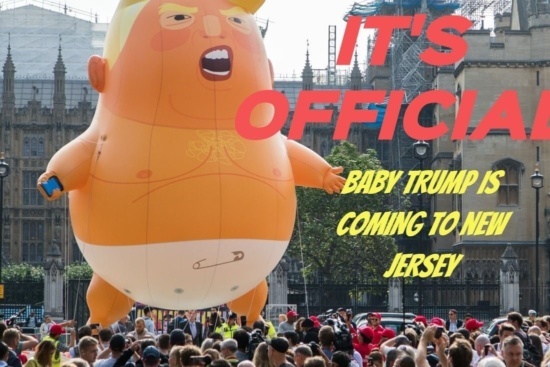 The American organizers initially sought to raise enough money to bring the original Baby Trump balloon to New Jersey and fly it near Trump-owned golf courses there, including the one in Bedminster. After the outpouring of support, they expanded their plans. Apart from making a political statement, the balloon is a successful combination of graphic design and temporary art, which literally rose out of events and served as a visual marker and magnet for thousands of peaceful protestors. It is one of the most publicized works of art since Kristen Visbal’s Fearless Girl statue appeared overnight in lower Manhattan just before International Women’s Day in 2017. Like Fearless Girl, it became a social media phenomenon. Much of its success was due to the design. The face is a shade darker and redder than the rest of the body, but the skin is lighter around the eyes, a reference to Trump’s penchants both for tanning and ranting. The bean-shaped body has a definite stodginess to it—a jab at Trump’s weight. The smartphone signifies his Twitter habit. The organizers say that the Baby Trump balloons they launch in America will be just like the first one. They told donors that all of the funds raised are being deposited in a dedicated account to be used for purchasing the balloons and covering the cost of permits, security, publicity, and “babysitter gear,” among other expenses. The organizers are currently seeking suggestions for areas and events to take the four balloons. According to NBC, activists from California, Texas, Louisiana, North Carolina, and Utah have already expressed interest. Supporters can follow the group’s progress on a Facebook page and on Twitter. If all goes according to plan, the activists say, the balloons will be ready by mid-August.